In The Art of Marriage®, we weave together expert teaching, engaging stories, man-on-the-street interviews, humorous vignettes and much more to portray the hope and beauty of God's design for marriage, and now the same great content is available in a six-week study format. In The Art of Marriage® small-group series, couples can explore God's Purpose and Plan, Overcoming Isolation, Fulfilling Our Responsibilities, Communication and Conflict, Experiencing Real Intimacy, and Leaving a Lasting Legacy in a home group or Sunday school setting. To fully participate, each couple will need The Art of Marriage® small group study guide. The study guide contains group discussion questions, mini-projects for completion during group meetings, date-night suggestions for couples and articles and tips for improving marriage. 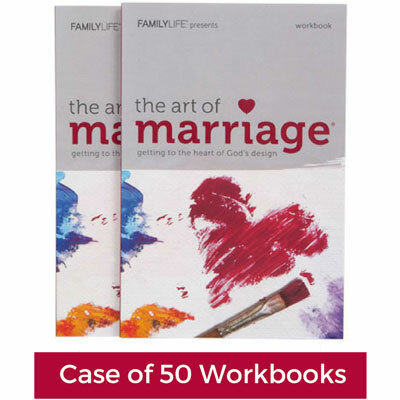 This case includes 50 workbooks so you can equip 25 couples for your event!